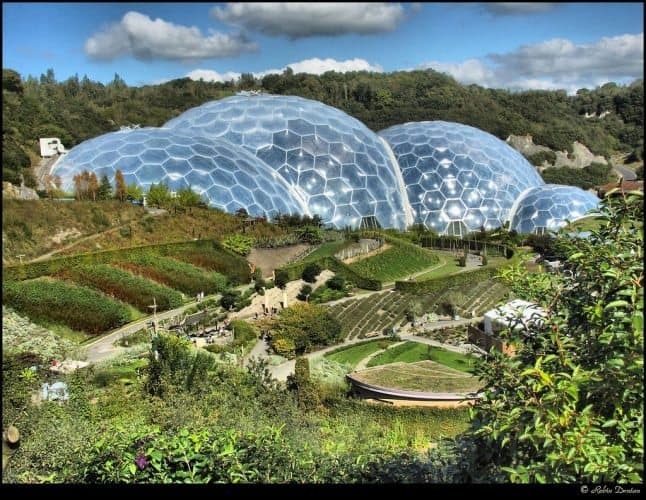 The Eden Project officially opened their doors in March of 2001. Thousands of visitors and staff were amazed at the new structures; The Times even called the biomes 'the eighth wonder of the world.' It only took three months for over a million people to visit and experience this unique concept. It's sad to say that most people will never be able to experience the wonders of walking around a real rainforest in their lifetime. And with the climate changing at a rapid pace who even knows how long these steamy climates will last. The rainforest biome is the closest climate that resembles an actual rainforest without having to leave England. There are four rainforest environments that the biomes replicate; tropical islands, Southeast Asia, West Africa and Tropical South America. A recent visitor commented, "the Rainforest Biome is a world class entertainment/educational attraction." The air is filled with the sweet smell of fresh herbs as well as scents of South Africa's Fynbos habitat. Everywhere you look there is something new and different from the gnarled out cork trees to the twisting mosaic path. A new exhibit recently opened as well within the Mediterranean Biome featuring the iconic grass tree, the red and green kangaroo paw and scarlet banksia who's eye-catching cones are triggered by fire or rain to release their seeds.